Dearen was born in 1951 and grew up in the small West Texas town of Sterling City. He earned a bachelor's degree in journalism from The University of Texas at Austin in 1974 and received nine national and state awards as a reporter for two West Texas daily newspapers. He is the author of nineteen books. An authority on the Pecos and Devils rivers of Texas, Dearen also has gained recognition for his knowledge of old-time cowboy life. In the late 1980s and early 1990s, he preserved the firsthand accounts of 76 men who cowboyed before 1932. These interviews, along with decades of archival study, have enriched Dearen’s ten novels and led to nine nonfiction books. His newest novel, To Hell or the Pecos, is based on actual nineteenth-century incidents along the Butterfield and Goodnight-Loving trails. His other novels include Perseverance, set along the rails in Depression-era Texas. 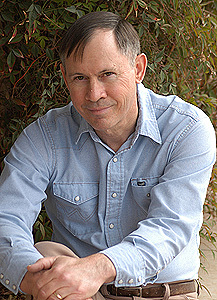 Dearen has been honored by Western Writers of America, West Texas Historical Association, and Permian Historical Association. A backpacking enthusiast and ragtime pianist, he makes his home in Midland, Texas with his wife Mary (managing editor of the Midland Reporter-Telegram) and their son Wesley. 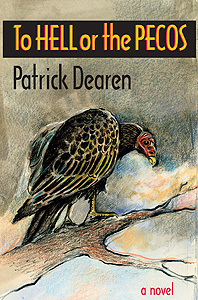 I've seen Patrick Dearen over the years at Western Writers of America conventions, and we made a connection, discussing social media methods, at the one I attended last June. Welcome Patrick. You've been a journalist for a large part of your life. What attracts you to write Western fiction, and non-fiction dealing with the West, as well? Perhaps my deep roots in West Texas are to blame. My forebears came to this region in 1887, and I remember as a child asking my pioneer grandmother for cowboy items that had been my grandfather’s. Right now, his 100-year-old quirt hangs within arm’s reach of my computer. As a young reporter for two West Texas daily newspapers, I traveled a region as large as the state of Ohio and heard legends and frontier tales that intrigued me. My earliest writing about the West came in the form of newspaper articles. It was a natural progression from there to nonfiction books and novels. You wrote your brand new novel, To Hell or the Pecos, as a tribute to the late Western writer Elmer Kelton. Tell us about your relationship with him. Although born 25 years apart, Elmer and I shared roots (West Texas), a journalism professor (DeWitt Reddick, University of Texas), a training ground (San Angelo Standard-Times), and a mentor and dear friend (Paul Patterson). It was the latter connection that carried us beyond a professional friendship into a personal one that I valued. Elmer was kind enough to write forewords to my first two nonfiction books, and provided blurbs (endorsements) for three other works of mine. But as superb a writer as he was, I remember him most for his humble and gentle ways. He was one of the few truly great men I’ve ever known, and we should all learn from him. I agree with you. My relationship with Elmer was to admire him from afar (or a-near, depending on how closely together we sat at a writers' convention or on a bus tour). He reminded me greatly of my father. Why did you determine to write a novel to honor Elmer? As I made the three-hour drive home from his funeral in August 2009, I pondered how I could best honor this special man who single-handedly lifted West Texas out of a literary desert. I decided there could be nothing more appropriate than to write a novel about the region he and I both loved, and to dedicate it to him. A good choice. You're a busy man with many interests. I read that you had been immersed in a huge research project. How did you find the time to write a novel, too? That was the tricky part — stealing time that wasn’t there. My only free time each day was devoted to my four-mile walk. So immediately upon my return from Elmer’s services, I grabbed a pen and a few sheets of blank paper and headed out for my daily exercise. I soon learned that I thought better while walking. Maybe not faster, but better. I developed my own new measurement: WPM (words per mile). Over the next 289 days, I averaged 35 WPM as I stayed immersed in the Pecos River country of 1886 while hiking under a blazing Texas sun and through winter snows when the chill factor hit 26 below zero. Try writing about characters facing heat stroke when the ink in your pin freezes! The short days of winter were an enemy, but I donned a headlamp and kept at it. On those occasions when I was out of town, I continued to write longhand — in airports and speeding cars, at the home of friends and along backpacking trails in the hostile Chihuahuan Desert. I never missed a day. By the time I wrote “The End,” 1,200 miles had passed under my boots, far enough to carry me from West Texas to the Pacific. I sometimes have trouble just doing the walking part. I love details of how things get done. How does one write as one walks, physically? First, don’t get run over! I only crossed one busy street in my typical walk, but each time, I had to drag myself out of 1886 and back into the 21st century. There’s also an art to wearing reading glasses and walking, but I learned to hang them on the lower part of my nose and use peripheral vision to gauge my next step. Probably the biggest challenge was in deciphering my chicken-scratching as I input my week’s work each Saturday. Thanks for the back story! When you write fiction, how do you come up with the story ideas? As much as possible, I draw straight from history and actual geography. I’ve written nine nonfiction books about early West Texas, and also interviewed 76 men who cowboyed before 1932. These represented the last generation of men who cowboyed before mechanization. So I have a wealth of material on which to base fiction. To Hell or the Pecos grew out of three actual incidents in the Pecos River country of 19th century Texas. In 1867, the Joel D. Hoy party was besieged by Indians at Horsehead Crossing on the Pecos. One person died and four others suffered wounds in a three-day ordeal. About 15 years later, a drifter abducted a teenage girl and fled to Horsehead, where several men overtook him and rescued her. And in 1890, two cowboys chased Mexican bandits across the same stretch of Butterfield Trail that I write about in To Hell or the Pecos. It ended with the death of one of the cowhands. That's rich material. Sell To Hell or the Pecos to me and my readers. Why should we buy and read it? Truth is always more powerful than absolute fiction, so I believe the novel's basis in actual events is a plus. But I think it’s my probe of the ethos and egos of the characters that stands out. Here's the story. For twenty years, Tom Rowden has been haunted by the memory of killing his wife at Horsehead Crossing to spare her from Comanches. Now Tom is dying, and he is riding back to Horsehead to make final absolution at her grave and join her. But Tom’s plans are sidetracked when Mexican bandits burn a ranch house, abduct a young woman (Liz Anne), and flee for the Pecos. Tom now sees an even better way to find absolution — he joins up with cowhand Jess Graham and three other men to try to rescue Liz Anne, whom Jess loves. Jess, too, is haunted. As a boy, he stood by without intervening and watched his father commit suicide. Now as Jess sees hints of suicide in Tom, he feels he has a second chance to right a terrible sin of omission. Before any of them can reach the Pecos, they face a 79-mile stretch of desert more trying than anything they’ve ever known. Powerful stuff! Did I read somewhere that there is a book trailer for To Hell or the Pecos? Yes. It can be viewed on YouTube, and also on my website, patrickdearen.com . Not only does it include photos of historic sites mentioned in To Hell or the Pecos, but also a stand-up I did at Horsehead Crossing, scene of the novel’s climax. I think it gives a potential reader a good sense of the novel. It does, indeed! I got shivers just watching it. We heard a lot at the last Western Writers of America convention about using social media to attract new readers. You have a website. Do you also have a Facebook presence? I do. In fact, I’ve posted a 10-part series on the historical background for To Hell or the Pecos on my Facebook author page: http://www.facebook.com/Patrick.Dearen.author. It's a wonderful overview. I enjoyed reading it. Where is To Hell or the Pecos available? It can be purchased through Texas A&M University Press (1-800-826-8911). It’s also available through major online sellers such as Amazon, Barnes and Noble, and Books-a-Million. Thank you for the interview and being my guest today, Patrick. Interesting. Thank you for the introduction. To Hell or the Pecos sounds like an adventure. Enjoyed the trailer, too. Thanks for visiting, Joan. I'm anxious to read the book, too. Enjoyed the interview and have added To Hell or the Pecos to my list. First time I've heard of anyone writing and walking. Leave it to a Texan and no offense to Mr. Dearen. I will check out his web site and facebook. Thanks, Oscar. I was intrigued by how Patrick accomplished his goal while out for daily exercise. Maybe I'll try it some time. Enjoy To Hell or the Pecos!